Its a common complaint, and likely a sign that the software needs maintenance. You can do this yourself, but it will take time, and to be effective should be done correctly. The WORST thing to do is search for and install a utility to "speed up" your PC. Mostly they are junk, often they will introduce viruses into your PC or even destroy your files. It may seem strange that your software needs maintenance - what can go wrong? As you use your computer - getting and reading emails, preparing documents, surfing the web, etc - large amounts of data are stored on your hard drive. This all adds to the work your computer must do in filing and finding data. It starts to become slow. This activity will also expose your computer to all forms of malware. Whenever you install a program or an update changes are made to the "registry". This is a "log" of all the events that happen on the computer. Like a diary - it keeps getting bigger. Errors arise in the registry, and this makes the computer slower and less reliable. Your hard drive needs to be checked to ensure there are no faults and there is enough free space. It may need re-partitioning. 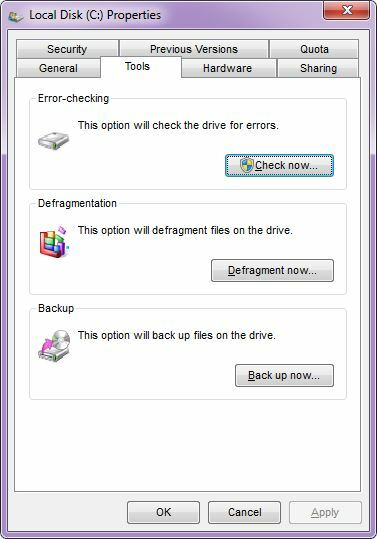 the organization of data on your hard drive needs to be re-organized (defragmented). Your anti-virus (AV) software needs to be checked for proper operation; some viruses can turn off your AV program! The registry needs cleaning out from time to time. Your operating system and installed programs need to be regularly updated to prevent "security holes" and improve performance. Temporary files and software you no longer need have to be removed. Some of these operations can be carried out using tools provided in windows; others require specialist software tools. If you wish to do this work yourself AT YOUR OWN RISK contact me - I'll be happy to send you instructions FREE. CAUTION: if the error check shows faults on your drive, your valuable data may not be safe. You should NOT defragment the drive, but take the computer to a repairer.